Looking for a delicious recipe for chicken wings? Try these healthier version of Easy Crispy Baked Buffalo Chicken Wings! They deliver amazing flavor and are baked, not fried! The delicious flavor of crispy buffalo chicken but using a healthier baked method which gives such a crispy coating to the chicken! Perfect for tailgating, Super Bowl, game day snacks. A great treat for Fathers Day too! As many of you know, I have made it my mission to keep enjoying the foods I have always loved, making it healthier, and taste even better than ever! My family absolutely loves Crispy Buffalo Easy Chicken Wings. 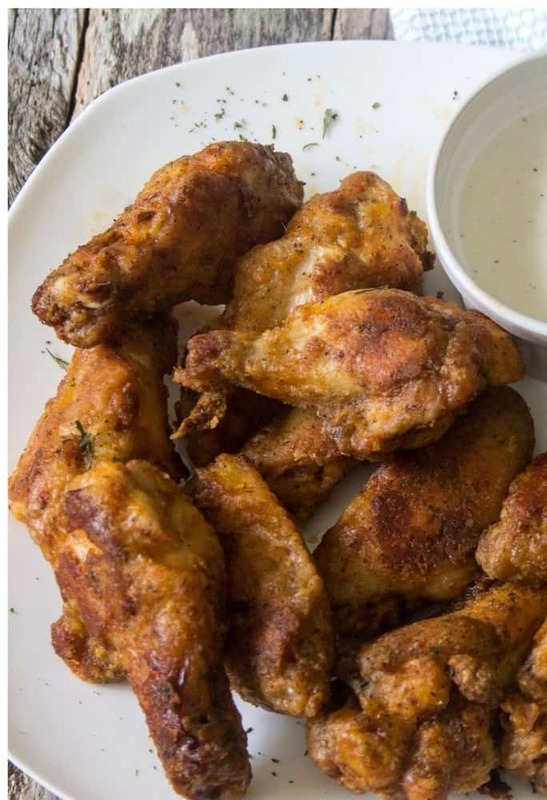 Actually, the just love chicken wings but one of their favorites is wings in Buffalo Sauce. The hubs loves them very well done, extra crispy! Years ago, I used to fry the wings, yes, I know not the greatest things for anyone’s arteries! While we do not eat wings every day, my motto will always be, everything in moderation! So y friends,if I can have something that’s even better than the original way I made it and much healthier, go for it!! I honestly would never fry a wing again! I played around for a long time with many different options for my crispy ! By far my friends, these are truly Easy Crispy Baked Buffalo Chicken Wings! I wouldn’t steer you wrong, These wings are amazing! Be certain to have the wings absolutely dry before dreading in the seasoned flour (this will assure a crispy wing). You can use a paper towel to pat the wings dry . Season your flour with the yummy spices I have added in the recipe. I am generous with the spice. If you want them milder, play with the spices. After coating the wings I let them sit in the fridge for about an hour on a baking sheet that has been sprayed with non stick cooking spray ( This gives a chance for the seasoned flour to really adhere to the wing) Okay, I have been in a pinch in the past and to for time sake, by-pass the sitting in the fridge. The wings were great but super crispy of they are allowed to sit in fridge. Just an hour, make your buffalo sauce, blue cheese dressing, cut up some carrots and celery, puton some music and enjoy a cocktail of choice! Then relax and think about noshing on the extra crispy wings while you while wait, well worth it! Pre-heat the oven to 425 degrees! I give a quick spritz of non-stick spray to the tops of the wings before baking. I bake for about 25 minutes. remove the wings from the oven and dredge in the buffalo sauce. Back into the oven flip side up for about 15 -20 minutes. Then we devour these wings. I pair these Easy Crispy Baked Buffalo Chicken Wings with a Blue Cheese Dressing, Ranch works well too! Don’t forget the celery and carrot sticks! A few other favorite chicken recipes you should check out are Grilled Spicy Chicken Wings or Easy Grilled Buffalo Chicken Lettuce Wraps ! 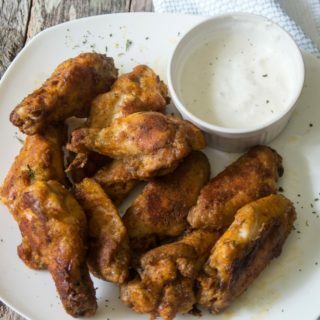 Need some suggestions to have along with these crispy wings, try Lighter Homemade Macaroni Salad, Slow Cooker Baked Beans, or Tuscan Bean Salad! SAVE THIS RECIPE TO YOUR FAVORITE PINTEREST BOARDS! I HOPE YOU FOLLOW ME ON PINTEREST!I’M ALWAYS PINNING FROM TALENTED AND AMAZING BLOGGERS! The crispiest baked buffalo chicken wings. 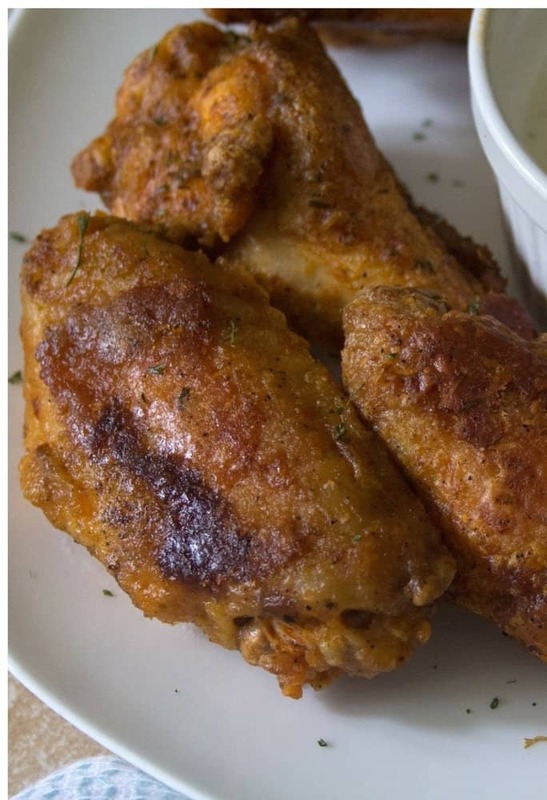 Using a spicy flour coating before baking makes these wings extra crispy. 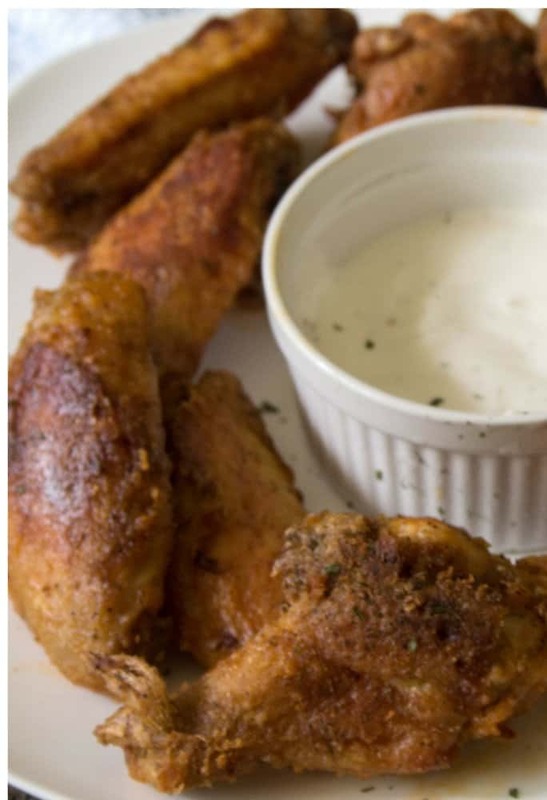 Baking makes these tasty wings so easy and healthier! You can also adjust the spice and heat from the hot sauce as needed. Ensure the chicken wings are completely dry before placing them into the flour. Pat them dry with a paper towel. In a large storage bag, add and combine the flour, salt, black pepper, garlic powder, onion powder, chili powder,paprika, cumin, thyme, and parsley. Place the floured wings on the baking sheet and refrigerate for about an hour. Remove baking sheet from refrigerator, give wings a quick spray with the non-stick cooking spray. bake for 25 minutes. While wings are baking, make the sauce. In a small saucepan over medium heat add the hot sauce, white vinegar, and unsalted butter until the butter is melted. (you can use a microwave for this step). Set aside until ready to use. Bake for another 15 -20 minutes until cooked through. Serve with Blue Cheese Dip, carrots, celery. If I am making these a head of time, I cook them for the first 25 minutes, dredge in the Buffalo Sauce and finish the cooing right before I am ready to serve. Prevents overcooking the wings. Nutritional information is strictly for the chicken wings. Does not include veggies and blue cheese dressing. I’m starving…I missed chicken for some weeks now. We rarely eat chicken because of bird flu but this made me decide to buy and cook today because it looks really delicious. I’m so happy you like the recipe! I hope you let meknow how it worked for you after you eat! These wings are my families favorite! Looking at them, I could imagine how crispy they are. They look incredibly delicious! They are super crispy and tasty too! YESSS I love buffalo wings! And making them healthier by baking them is always the best. I will try these with my favorite sauce soon! 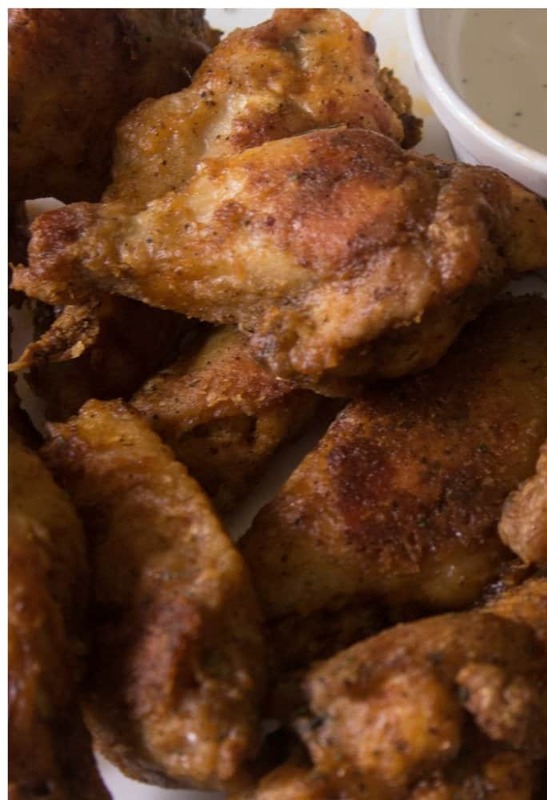 I like this recipe because we eat our wings on the crispier side in our household. Whenever I’ve made mine, I didn’t put in the fridge for an hour before cooking. I will have to try this method out. These crispy buffalo chicken wings are sure to be a hit in my house. They look so delicious and easy to make. I will have to get the ingredients I need to try them on the weekend. They are super easy! My non-cooking kids can make these too! Oh these sound SO delicious! We love making wings, but I haven’t tried a recipe like this! I can’t wait to try it out – it looks so yummy! I hope you let me know when you make these Adriana! They are so easy and taste great! These look so tasty! I usually fry mine to get them to be extra crispy. I love that these are baked . Cannot wait to try! I love a good buffalo chicken wing, but always dread the baked wing because it just doesnt have that crisp I like. But I’m going to try your method, especially leaving it in the frig for an hour because I’d really love to be able to make these at home. I love the taste of baked buffalo chicken of any type. Since we usually serve wings with all of our parties, I’m going to have to try the buffalo chicken wings. I wonder if it takes like my buffalo chicken dip. If so, it’s going to be a hit. I love making wings. I just walked into my house less than 5 minutes ago – with RAW WINGS. Well that is fate! I hope you make and enjoy these tasty wings! While I don’t eat meat myself, I know a lot of people who would love to try this recipe. Now these sound like they would be right up my street, I love the idea of them being extra crispy! YUM! That looks absolutely delish and is easy to make! Thanks for sharing your recipe, gonna try this someday for dinner. Really need some good ol’ buffalo wings. We are huge fans of buffalo wings. I’m sure my family will flip for this recipe! Oh my! This recipe is just perfect! I am always on the hunt for easy recipe because I am lazy in the kitchen. You go one of my favorites! You must know how much I love buffalo wings. Yummy! My favorite. Your buffalo chicken looks so tasty! I vet that my hubby would really love this recipe! I hope he likes them as much as my hubs! This buffalo chicken looks so tasty! Slurp……I can not keep my mouth shut. I will try to make one. Thanks Eileen! Awesome Sabrina! I hope you enjoy and let me know when you make it! We love it because it is so easy and tasty!